Macarons have become one of my favorite things to make in the kitchen. But it didn’t start out that way. In college I must’ve tried to make macarons 5 times. Each time my cookies came out like sad, thin puddles that melted all over my cookie sheet. I hated macarons and I honestly didn’t believe it was possible for me to make them right. Flash forward to now. After countless tries and half-fails, I finally figured out l’art de macarons. I developed a recipe that produces the most airy, light macarons one could hope for. All this to say that if you think that macarons are beyond your baking abilities, I strongly encourage you to try these! Of course, it’s all about the folding and the drying. Pay careful attention to the way that your batter falls from the spatula. You’re looking for 1/2 inch thick ribbons to flow slowly into the batter, like lava. There should be a slight resistance to the batter, like it wants to be solid, but gravity is pulling it down. The macarons absolutely need at least an hour to dry out before going into the oven. This will help them to puff up while they cook, ensuring a nice, thick macaron. If you follow these tips, you should end up with a perfect macaron. Now onto more things. The entire reason behind creating a coconut macaron is because of Zainab of the Blahnik Baker. This lovely blogging friend of mine is due to have a baby boy at the end of this month. 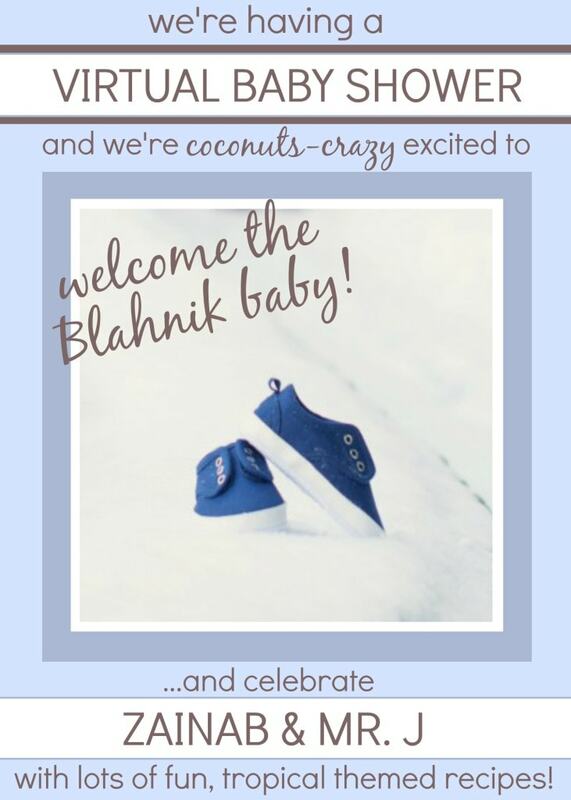 A bunch of her blogging buddies have teamed up for a virtual baby shower, and I am so excited to be a part of it! Zainab is the queen of all things tropical. From her Pina Colada Ice Cream to her Key Lime Cupcakes, this girl knows how to take bright, citrusy flavors and put them in baked goods. Her favorite? Coconut! 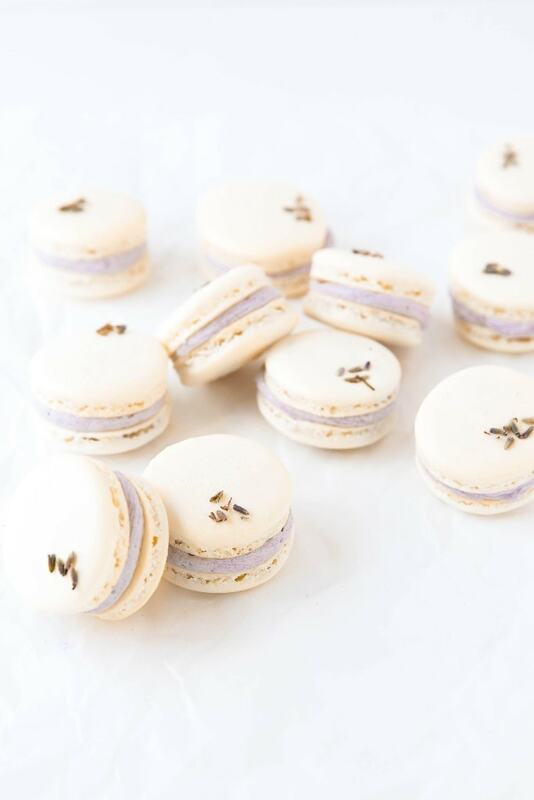 So these Lavender Coconut Macarons are in honor of Zainab, her husband, and their soon-to-be baby boy. 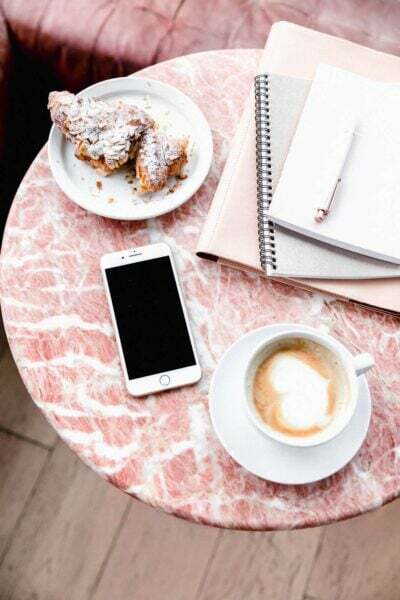 Do check out the rest of the blogging buddies’ posts. There are some awesome treats at this virtual shower! Using a fine mesh strainer, sift the almond flour and powdered sugar into a medium bowl. Sift the mixture again two more times. You should be left with small almond granules each time you sift. Toss these out after each sifting. 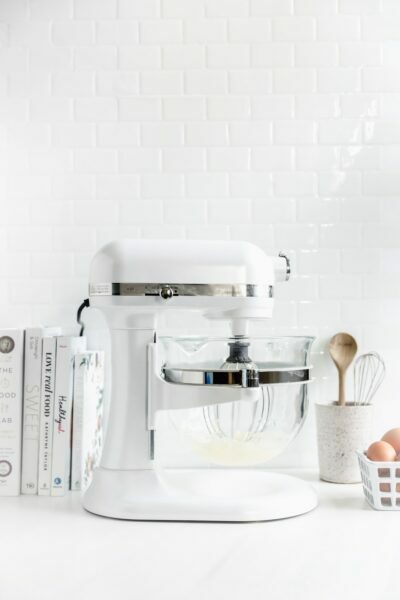 In a standing mixer using a whisk attachment (or mixing bowl with a hand mixer), whip the egg whites and salt on high speed for about 2 minutes, until soft peaks form. Add in granulated sugar and coconut extract and continue to beat for 1 minute until very stiff peaks form. The egg whites should be foamy and firmly hold their shape. Fit a large pastry bag with a ½ inch tip and scoop your mixture into the bag. Pipe 1¼ inch circles onto 2-3 parchment-lined cookie sheets, leaving at least 1¼ inches between each macaron. The best way to make even circles is to pipe from directly above the macaron so your pastry tip is perpendicular to the cookie sheet. Squeeze the pastry bag from the top with one hand while using your other hand to steady the tip. Once you’ve piped your circle, swirl the pastry tip in a small spiral and lift upwards at the same time to finish your macaron. 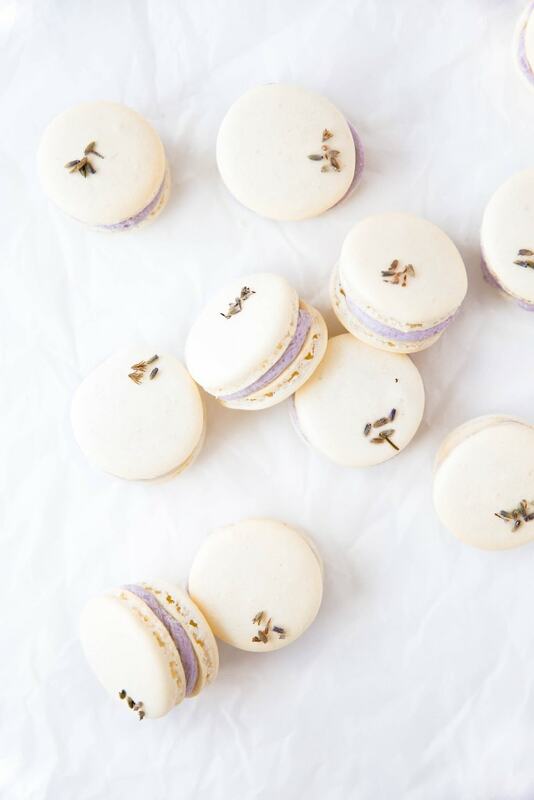 * Garnish the macarons with 2-4 dried lavender flowers. Allow macarons to air out for at least 1 hour, and up to 2 hours. Preheat oven to 300°F. Bake macarons for 17 minutes. Allow to cool completely on their tray before frosting. To make your buttercream, combine the milk and lavender flowers in a small pot and heat until the milk just begins to bubble around the edges. Turn off heat and allow to come to room temperature. Use a fine mesh strainer to strain the lavender flowers from the milk into a small bowl. Beat the butter and vanilla extract until light and fluffy, about 2 minutes. Add in the powdered sugar, infused milk, and food coloring, beating again until light and fluffy, 1 minute more. Transfer to a small pastry bag fitted with a ½ inch tip. Once your macarons have cooled, frost and serve! *There are a ton of video tutorials out there that show good technique for all stages of macaron making- check them out! These macarons are BEYOND gorgeous . . these are like French boutique high-end . . ohmygawd worthy. . stunning and beautiful and in love with the flavor profile! Thanks for helping us celebrate Zainab! Awww, thank you so much Alice! So glad to be a part of the celebration!!! These macarons are just gorgeous!! Oh my gosh!! these are just stunning!! I have a relationship with macarons that’s just love and hate when it comes to bakign them. I need to try your recipe here!! Thank you so much for the shower love! Of course!! We love you!! As always you have totally knocked this out of the ballpark. Can this shower be real pretty please? These macarons are so pretty! These flavors sound like something Zainab would bake! They look gorgeous. I recently started making macarons after fearing them for a long time. Now they are so much fun! Thank you Julia. And they are so much fun! Once you get the hang of it, you don’t want to make anything else! These macarons are just stunning, Sarah! Love the lavender and coconut combo, these are just perfect for Z’s shower! Thank you Kelly! Wishing the shower was real so I could eat all these delicious treats! You’ve nailed the macaron! Beautiful work, Sarah and those flavors (bug eyed emoji)!! What a delicious way to celebrate! I adore coconut so this baby shower food is making me drool! Thank you for this! Thank you for including me! So happy to be a part of it 🙂 And let me know if you make them!!! GORGEOUS Sarah and I love the flavors! They will totally satisfy the coconut lover in me! I am seriously considering making them again because they were so good! Macarons are one of my favorite things to make too! Yours are STUNNING! Gorgeous pictures too! Aren’t they fun? So glad you enjoy! Love macarons and these are perfect! Love the pictures! Congrats Zainab! These ares so delicate and beautiful! I bet they taste as good as they look too. Perfect for a baby shower. Thank you Erin! Macarons are perfect in their little dainty-ness aren’t they! These look like they came out of heaven! Gorgeous. You have to teach me your ways when we get together. Macaroons are still on my “bucket list” of things to make. Oh then we’re DEFINITELY making them together! These look gorgeous, Sarah! 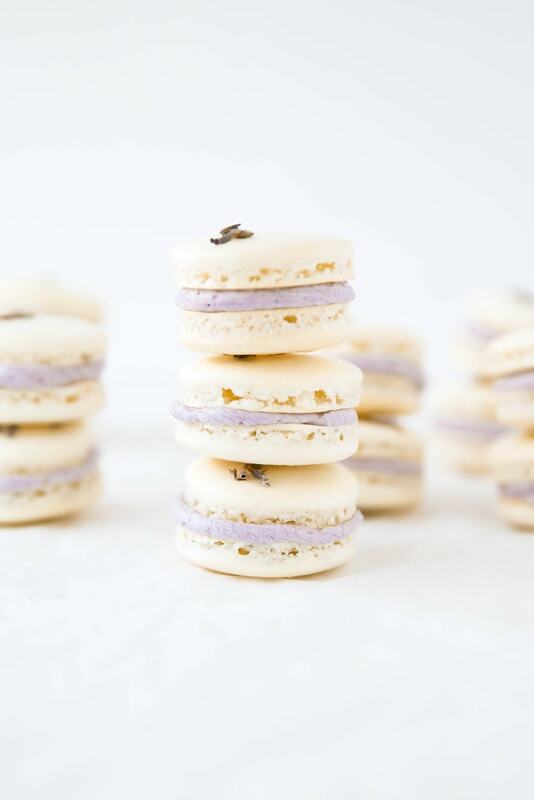 Great minds think alike because I just made apricot macarons this week :p Yours look stunning, though, and I will definitely have to try your recipe as I love lavender flavored foods as well as coconut ones. Yum! Oh I cannot WAIT to see them! These are the most perfect-looking macarons I have ever seen! 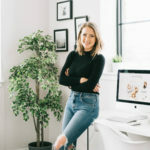 I really love your blog Sarah, your photography is absolutely amazing and all your treats just about knock my socks off! Including these darling macarons, I will have to try them and master the art of macaron-making! Thank you SO MUCH, Jessica! I so appreciate it. Don’t be a stranger & happy baking! These macarons are glorious and I’m definitely going to try your recipe! I’ve never been 100% satisfied with any that I’ve made. These are so perfect to celebrate Zainab and her family! What gorgeous macrons! I have yet to try to make macarons as home, definitely something on my bucket list! Thank you Nancy! They’re a hard one to crack into, but once you do they’re so satisfying! You have definitely nailed the macaron thing 🙂 Love the flavours in these ones. Perfect for a baby shower! Thank you Jennifer! Mini cookies for mini humans! Girl, I’ve been trying to make macarons for the longest time and made 2 failed batches!! I might be making these tomorrow or next Wednesday because I’m determined to get it right!! Fingers crossed! Also, LOVE the lavender and coconut pairing! Z must love these! 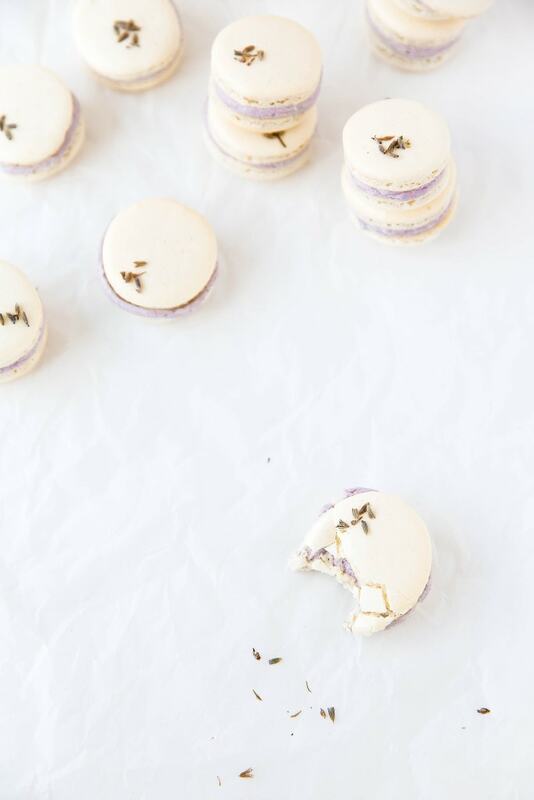 These macarons are so stunning and sophisticated! The perfect way to honor Z and Mr. J and their lil baby! Sarah, these macarons are stunning! I am so glad to hear your macaron story – I am still in the “terrified” camp but am determined to overcome my fears and start making macarons! I love how much you love macas. SO GOOD! 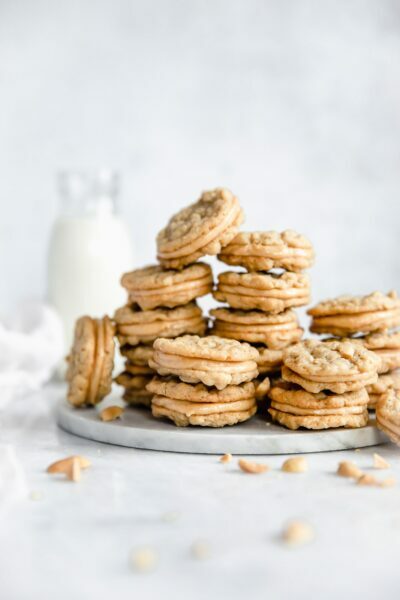 Maybe you will make me some peanut butter ones to crush my peanut butter cravings. Okay, I OBVIOUSLY need to try your recipe for these because the recipe I though I had perfected hates my new oven. GORGEOUS. And I love the flavor combo! So perfect for celebrating new life. These macarons are so gorgeous!! What a perfect treat to bring to the shower – I bet the taste is incredible! I’m shopping for ingredients today to make these this weekend. Yours turned out beautifully. I’m not giving up on the elusive perfect homemade macaron. Thank you Lisa! Good luck making yours and let me know how it goes!